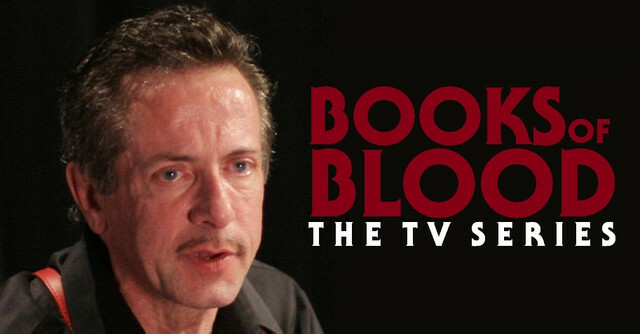 Clive Barker Is Developing A BOOKS OF BLOOD TV Series! If you are a fan of the one and only Clive Barker, then today's news may be just what you've been waiting for. Barker himself has announced that there is indeed a TV series based on BOOKS OF BLOOD in the works. Barker has been working with this new project along with Brannon Braga. He went on to add that the series will be expanded from the original stories to include new tales to be told. He also stated that the new stories will be aimed to at very least match, and in some cases surpass the intensity of the original BOOKS OF BLOOD. "Next, [is the] the television adaptation of The Books of Blood, a series I'm working on with Brannon Braga, [Star Trek, Cosmos: A Spacetime Odyssey, Salem, 24, and more] is going forth, speedily, and working with Brannon is an absolute joy." "I should add I think, because this is tasty, the series has been expanded from the stories in the Books of Blood with stories that have been developed by me along the style of the Books of Blood stories - because it's thirty years since I wrote the Books of Blood and my mind has certainly not remained empty of those kinds of ideas. So there are, I think, about thirty narratives which I have developed which you could call 'Books of Blood stories', as narrative outlines, but I haven't yet turned them into stories. We will probably turn at least some of those into episodes for the television series." "What I'm trying to do is at very least match, and in some cases surpass, the intensity of the original Books of Blood. Some of those stories have a nod and a wink to another kind of narrative - I mean New Murders in the Rue Morgue, is an example, obviously a nod to Poe, but then there's Rawhead Rex which is a straight-off monster story, and I want to revisit those kinds of stories. I want to do a new monster story for instance, something that is fresh and for a modern audience." "I am hoping that in the Books of Blood series we will not only go to the most chilling and intense of the books but I will add to that sum of stories new tales that perhaps wouldn't even have occurred to me thirty years ago. The world has changed. The world has become a darker, scarier place since then, unbelievably but it's true." We will continue to keep you up to date on this story as it unfolds.